After many, many years working as an independent consultant out of my home office, there are some wonderful benefits of being in an office - particularly a sense of community. There are benefits to working remotely, of course, as Rosabeth Moss Kanter points out in her piece, "Stay at Home and Work." In terms of sustainability, you can reduce your carbon footprint. There are policies and change management issues around working remotely. David Neff is wondering how nonprofits handle remote working arrangments, specifically "How do you interact/manage/meet/discipline employees that work from home or even work across the globe?" The online celebration of Earth Day is in full swing as evidenced by the Google Earth Logo and Twitter hashtag #earthtweet. Lots of great resources being shared, including using social media to promote sustainability ( see "The 12 Faces of Social Media for Green Marketers and Sellers of Sustainability"
An excellent resource for everything green and nonprofits and tips for celebrating Earth Day, check out GreenNonprofits. 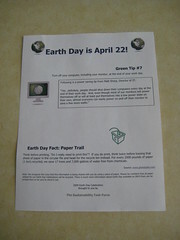 They are encouraging all nonprofits to take the green pledge. GreenNonprofits is also writing a book and is crowdsourcing the cover art work and title. Take the quick survey here. My Earth Day celebration was to take public transit. But, I've been doing that every day I'm here in Palo Alto or riding a bike as I've decided to go carless. Aside from the sustainability benefits, I also get exercise. What are you doing to celebrate Earth Day personally or in your nonprofit's office? I've been re-reading Patti Anklam's book, Net Work: A Practical Guide to Creating and Sustaining Networks at Work and in the World which covers the many different forms of networks and how they work. It covers different models for purpose, structure, style, value creation, design, leadership, and change management. I first met Patti in Cambridge during a dinner with John Smith and other colleagues from CPsquared. I had just gotten my N95 and I live streamed some of our dinner conversation. I'm reading to help me think through a recurring theme ... "How, When, and If to Weave and/or Strengthen Networks Using Social Media." We can answer this question pretty well in the context of nonprofit organization for its external communications. Lots of best practices over at the WeAreMedia. But what about for internal coordination/collaboration? View more presentations from ValueNetworks. As you can see from the above slide share deck summarizing some of the key network concepts in her book, the book is not about the technology of networks. However, she offers an essay in the Appendix "The Technologies of Net Work." When she was writing the book in 2007, social media (both consumer and Enteprise level) were still in the early adopter stages and changing rapidly. If you remember, Facebook had just opened up to people who were not college studies. So this essay provides some contextualization and principles from online collaboration from the Web 1.0. I think some of these are still, very relevant to for organizations or networks that want to use social media for online collaboration. Since the early 1990's, technologies to support connections have danced a mutually reinforcing dacen between the capabilities of the technology and the ways that we use them. As move into an increasingly networked world, they will be more and more important for creators and contributors of networks to learn, adopt, and adapt. Select and match technology to meet both Network activities and those of the individuals participating in the network. This point is about examining in detail the work practices or work flow and making sure that the technology supports it. But what if social media requires changing some of the practice or if not everyone as similar work flow. Give people multiple ways to learn and provide online and face-to-face coaching as well as documentation and formal training, if required. View more presentations from lnorvig. Laura Norvig gave me a sneak peak at her ingite presentation for NTC Ignite called the Many Uses of FriendFeed. I'm looking forward to hearing her give the talk. For those of you who are wondering what the heck is an ignite presentation, it is a style of presenting where the speaker has 20 slides, mostly visual, and spends no more than 20 seconds explaining each one. It is intended as a rapid and engaging way to present information. For more details, see this wikipedia entry. 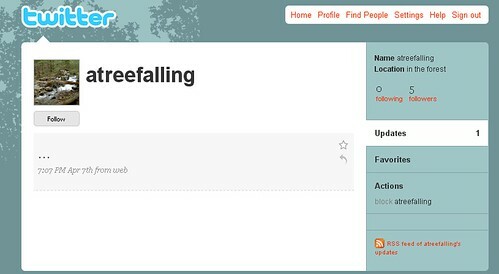 Some of you may be wondering what the heck FriendFeed is as well. It is one of a number of "life streaming applications" where individuals and organizations who are active on the social web can port their activity across social networks into one, easy to follow, read, and comment activity stream. These services are powered by the RSS feeds that each network offers to its users and makes following activity across sites easier and in one spot. 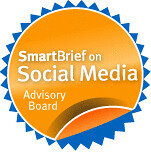 With Twitter becoming more mainstream, perhaps we'll see more activity on FriendFeed. I use FriendFeed to follow a group of people in more depth because I can see their complete social media activity in one place. It gives me a better snapshot that just following a Twitter stream. I've used a little social network theory to design my FriendFeed friending strategy. It boils down to following the few to find the many! In other words, I identify connectors across different "hubs" or communities that I want to track. It is also good for conversation around resources or crowdsourcing research. In fact, I watched Laura crowdsource some of her presentation on FriendFeed. FriendFeed also has "rooms" that can be public or private - these feeds with discussion items. 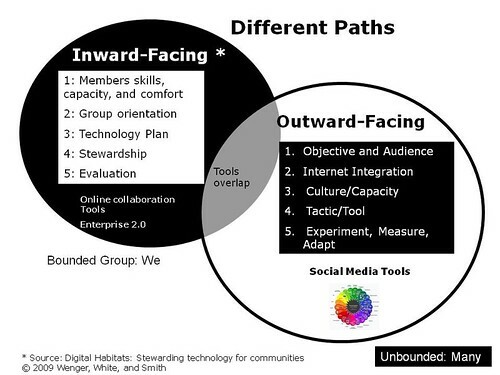 About a year ago, a group of nonprofit technology social media early adopters ran a couple of experiments using FriendFeed and an NpTech room. I summarized our learnings from this experiment in a series of posts that also includes some useful how to posts. I remember Laura was an active participant in those experiments. What I love is the idea of setting up a private room for organizational listening that Laura suggests in the slide deck. She suggests that FriendFeed private room would be a great way to facilitate some discussion around the feeds. Of course, the folks participating would have to be comfortable using FriendFeed and make a habit of it - but might be a good way to support a team listening effort with free tools. SocialTNT: How to Use Friendfeed for Better PR - Although parts of this post assume you are interested in getting PR coverage from Silicon Valley reporters, it does give a nice overview of FriendFeed for newbies. How Bloggers Can Use FriendFeed Effectively - This post includes some great tips on how to contribute value to FriendFeed, keep your "signal-to-noise" ratio high, and use "rooms" effectively. What lies beneath social media stress, fear, and barriers to adoption in nonprofits? If you witnessed how Web 1.0 was adopted (or not) in the nonprofit workplace over the past 10-15 years, you'll notice that fear and silo culture are nothing new or unique as barriers to adoption. Steve MacLaughlin recently pointed this in an email. He often uses the metaphor of not having your web strategy or data be an island. Steve said silo culture has been a barrier to effective web strategy for years. "The Web is still its own silo in many organizations. It isn't used as part of an overarching strategy. When nonprofits started using the web, it was largely disconnected from what the rest of the org was doing. It started out as something done by communications or marketing or "owned" by IT. That makes sense, but it created a silo." This sent me back into my archives from over ten years ago when Web 1.0 was going mainstream in nonprofit workplaces, along with the need to develop technology plans. Similar adoption issues and themes surfaced as I identified in my recent post on social media policy. When I facilitated technology and web workshops for nonprofits in the 1990's, I did a lot of workshops on TechnoStress where small groups would identify their concerns and then literally draw a picture of them. These are some drawings and reflections from nonprofit staff members in the early to mid-1990's about using the web, email, etc. Today, they might not view these now mainstreamed web tools in that way. But would some of the same fears surface about social media? The term "TechnoStress" was coined by Michelle Weil and Larry Rosen title of a wonderful book. TechnoStress is the stress we feel both personally and organizationally when a new technology is introduced into our work lives. This book was written in 1997 just as Web 1.0 started to cross the chasm. The authors were concerned about people who were not using the Internet and being excluded from the benefits. They estimate that about 10-15 of the population are eager to adopt new technologies, another 50% need to have the value proven, and the rest are fearful of new technology. If you are one of the 10-15% of early adopters in social media, it is important to understand how to provide assistance to help others cross the chasm, whether individually or as an organization. 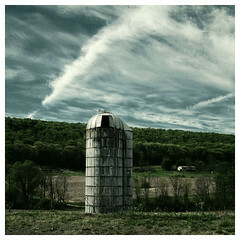 Amy Sample Ward shared a collection of links recently pointing to my post about silo culture. In a follow up email, she asked what might be different about the adoption issues for social media? What makes this different is that the technology that is driving this change - the "social graph" or the map of connectedness that we're creating through participation in online social networks. This technology impacts us personally first before it enters the workplace. 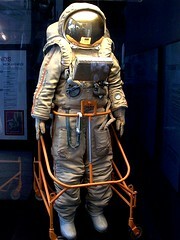 In the past, adoption of technologies like Web 1.0 and the personal computer were driven by the workplace. Leveraging personal networks of individuals: These tools allow us as individuals to build powerful networks and social capital - and this can be used to help our organization's achieve goals. The tools make the line between personal/organizational is quite squishy and that's a change management issue. Moving from .org to more networked organizations: Can nonprofits continue to be silos in and of themselves - not to mention continue to work internally as silos in an age of social media? As my colleague Allison Fine says it is the need to move to network speak and think about the nonprofit staff, volunteers, board, and funders as nodes within their network which is only part of a much larger network of people and resources. What change management process is needed to move away from organizational silos or islands to fully leverage the social graph and power of social media for nonprofits? What are the consequences of ignoring the need to make this shift? Do all organizations need to adopt social media or not - or at least this new way of working? Joitske Huslebosch, Can You Shift Your Organization's Culture By Introducing Social Media? Amy Sample Ward, Moving Away from Organizations To What? Recently, I reconnected with colleague, Joitske Hulsebosch, who I met in 2005 through Nancy White's Online Community workshop. I interviewed Joitske about her work way back in 2006. I asked for some recommendations on Twitter for the best practical sources for change management. Joitske recommend Learning To Change. She also pointed me to an older post on her blog about one of theories of change in the book based on thinking styles. I did a mashup with social media framing. Now, have to get my hands on that survey and see if there my noodling holds water. * Yellow-print thinking. People change their standpoints only if their own interests are taken into account. * Blue-print thinking. People or things change if a clearly specified result is laid down beforehand. * Red-print thinking. People change if things are appealing and inspiring to them. 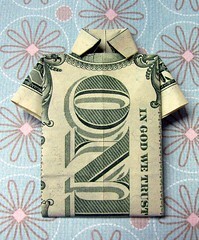 * Green-print thinking. People change if they learn. They are motivated to discover their limits. * White-print thinking. Everything changes autonomously, of its own accord. " The book, written in 2002, does not address social media and change management or even technology. That lead me to the above noodling. I also wondered about the historical context of change management and technology tool adoption, asking on Twitter if there case studies about the adoption of the typewriter in the workplace. Lucy Bernholz, who shares my interest in contextualization, pointed me to this essay about artifacts and change describing the change brought about by the introduction of the typewriter into the workplace. Think about some of the changes reflected by this typewriter, manufactured by E. Remington & Sons around 1875. It tells a story of innovations in technology and manufacturing. The adoption of the typewriter, at just the same time that women began to work in offices, reflected changes in women's roles, new ideas about the organization of work, and the rapidly growing corporations of the day. In turn, the typewriter brought about and helped to accelerate social change, opening up new jobs for women in the office. Changes in Business and the Workplace. The typewriter, by reducing the time and expense involved in creating documents, encouraged the spread of systematic management. It allowed a system of communications that shaped the business world. The growing awareness that there is a need for change management to accompany Web 2.0 projects in organizations. I arrived with my concept of Web 2.0 being a tool for change facilitation - which it is. But I had to realize that introducing social media as a tool for better collaboration, either across an organization or with outside stakeholders needs to be facilitated. It's like the introduction of personal computers 20 years ago into offices, or a big ERP project. And it seems that as long as the netgen generation hasn't entirely taken over all positions within organizations, there will be resistance to implementation of Web 2.0. For a couple of reasons: IT departments want to protect the security of the company's system, Boards fear that will not be able to contain openness and transparency once people are encouraged to write blogs, collaborate on wikis, etc. And putting customers into the driving seat of product development actually means turning how many companies work upside down. 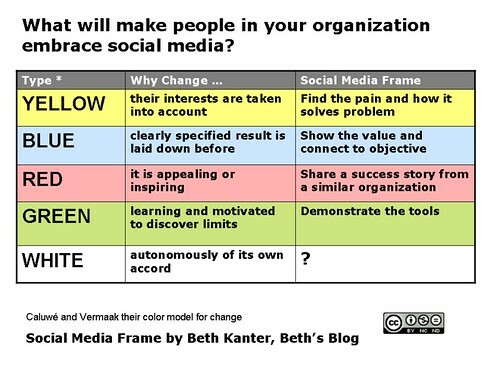 Joitske poses a good question when she asks, "Can you shift your organization's culture by introducing social media? "Joitske observes that the power of social media is more about the culture of openly sharing knowledge, collaboration, and engaging in co-creation. She points out that having the tools does not mean you have improved the collaboration between your professionals. It reminded of the questions we discussed in the early 1990's about using online collaboration tools for nonprofits. For example, if an organization does work online with board can it be effective or I used to say, "a dysfunctional board offline is dysfunctional online." Is your organizational culture ready for social media or do you want to shift the culture by introducing social media? What is the actual change you are envisioning? Can social media play a role in this? What are the other inventions that are needed to help change the organizational culture? Joitske says you to begin with assessing the culture of the organization and see whether there is a match or a mismatch with social media cultures. Definitely agree that Esther Dyson is a leader on tech adoption. Clayton Christensen/Michael Horn's disruptive innovation writings (most recently about education).. In the social sciences, I'd recommend Everett Rogers' Diffusion of Innovations. It's considered a classic. A couple years ago I interviewed Christine Beckman (Cal-Irvine), who has done some interesting organizational research about how methods and technologies are adopted by different types of firms. What are your best resources of change management? I'm looking for practical sources mostly. I happened to notice that the tag #maddie was trending on Twitter as few days ago. My first thought was to mentally run the names of celebrities with the first name Madeline. I drew a blank, so I clicked over and started to read the Twitter stream. 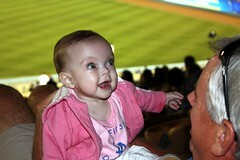 I discovered that a premature baby named Madeline (Maddie) Sphor had passed away last week. There was a deluge of sympathy expressions because the funeral and memorial service were taking place. It was also a virtual rally from friends and networked friends to raise money for the March of Dimes in Maddie's memory. It's also another amazing example of the power of ambient intimacy and compelling, authentic storytelling. It brought tears to my eyes, and I don't know this child or her parents. The March of Dimes sponsors a fundraiser called "March for Babies" where teams of supporters, many parents of premature babies who are fighters or who didn't survive, raise money to support research that will help find the answer to serious problems that threaten babies. Not only has the tag been trending on Twitter, but there have been hundreds of beautiful and touching blog posts. The many ways the community has self-organized and come together to find ways to support and help the family in this difficult is nothing less than amazing. How does March of Dimes support and work with its community? How did the organization staff support this effort or not? Curious how their social media is organized within the organization? If a Tree Tweets In the Forrest of Twitter, and No One Sees It, Does It Exist? I included a visual from Gary P Hayes which maps a ladder of engagement in social media storytelling against influence. It shows that content creators (those passionate folks who will co-create - the time consuming piece) have less influence than sharers. It prompted a question, why? Gary answered my question on Twitter. "Does anything created exist if not exposed?" I'm not sure if I would say content creators have "less" influence than sharers-- but impact and audience/participation are tied in this process and you need to make certain content is seen to build a community of participants. So in that sense, the process is dependent on sharing, distribution and entry points into the story universe. But creators wield a separate kind of influence on this process in the ability to shape the content and its effect on perception. The whole ecosystem of engagement is important. Social Media Behind the Firewall: The Tire, Tower, or Hub and Spoke? How can I get my culture to adapt? How can I make my campaigns work? What am I supposed to measure? Does social media even matter? For this post, I wanted to focus on the first issue - the mismatch between organizational culture and social media adoption. To be successful, the organizational culture needs to be a learning culture, willing to experiment and learn. As Charlene Li pointed out, "Change management processes take years - you don't change over night. You need to start small and get comfortable with the technology. You need to get the big guns involved and the only way to do that is to find the sweet spot between outcomes or goals and demonstrate how the social media strategy supports that." Take for example, the steps outlined in this "Twitter for the Workplace" article. Translation for nonprofits: Explain your social media strategy and how it supports your organization's key outcomes. They also warned against having social media be one person's responsibility or that it is a younger person's game. Social media is about engaging with your stakeholders - whose responsibility is that? 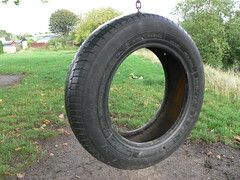 The Tire: Social media forms at the edges of the company. No clear leader. Upside: appears very authentic. Downside: one side has no idea what the other is doing. I've seen this model with nonprofits and I'd add that the other downside is that the implementation isn't strategic. The Tower: Led by corporate communications, by executive mandate. The upside: Lots of resources. The downside? Not authentic, which saps participation and buy-in. I've also seen this model in nonprofits and it isn't effective when silo culture gets in the way. Here's another anecdote, shared anonymously from a reader via email. At my nonprofit, I work in the web department and we have been tasked by the executive director and director of communications to implement and oversee our social media presence. Implement and oversee, that is, without input from any other departments. There are 250 employees, so to task one group--a group that has no contact with members at all--with handling social media is a little weird to me. At the same time, I'm grateful that they're open to using social media in the first place, so I don't want to complain too much. We actually have developed a pretty robust social media presence. We even have a staff person dedicated to social media implementation--me! But they didn't tell anyone on staff about it! So, weirdly, my whole job description is to work with other departments to develop and implement their social media stuff--but nobody knows my position exists unless they personally know me (which most people don't). I do work with people in other departments a bit, but on a totally individual basis--usually I approach them with an idea and work with them to implement it. But as far as, say, having a team drafting the social media strategy, I've suggested it and been told that no, we'll draft it then others can comment. The result is that I feel like I'm sneaking around behind other department's backs drafting a social media strategy that they're not even aware of, and know that when we finally present them with this completed strategy for their approval, heads are going to roll. I'm constantly having to field complaints from staff "how come when our department wanted to do that we weren't allowed to but now you're allowed to?" "Why should the web team be handling this when it has nothing to do with the website?" etc. The web team is the only team that has authority to establish a presence on social networks--that alone is a huge point of contention. People in our organization are getting downright nasty about who "owns" social media? That and the fact that silo culture absolutely prevents social media strategies from succeeding so, really, what's the point if the internal communication issues aren't going to be addressed as part of the strategy?" Hub-and-Spoke: some central focus, but with clear ownership at the edges. Upside: this is the aspirational model because it combines resources and participation. Downside: the most difficult to establish. Charlene Li shared an exercise that does with corporations that sounded very similar to the share pair exercise I created for the WeAreMedia Workshop. -How do you mitigate those risks? -What are the benefits on the other side? How is social media organized within your nonprofit organization? Does it match any of the above models? Is it working? Why or why not? Social Media in the Nonprofit Workplace: Does Your Organization Need A Social Media Policy? I've been hearing a lot lately from folks who work in nonprofits asking for examples of "social media or social networking policies." There are examples (see below). But, if an organization simply cuts and pastes a social media policy without the internal culture change, it won't be effective. "I facilitated social media guidelines as a first doable step because there was so much fear about encouraging staff to use social media at organization. Laying down guidelines makes everyone think they have more control and it helped everyone to feel better. In truth, our guidelines are quite vague. It goes on for a while but really just says, "Use common sense and please don't say stupid stuff. In fact, we'd love it if you told your personal institutional story in a constructive way." Colin McKay (aka Canuck Flack) in his Nonprofit Secret Underground Guide To Social Media Adoption suggests that most nonprofit organizations (well large ones) already have policies in place to deal with potential concerns about social media. That social media doesn't create new behavior, only amplifies existing behaviors. A few years back, most of us on social networks might have answered the question, "How Do You Use Social Networks?" with "just for fun." But as more and more organizations flock to Facebook and social networks aren't just for kid anymore, nonprofit staffers are using their personal profiles for professional networking online. The first wave of this was the social media strategists for nonprofits, take Wendy Harman for example. where staff members are active on Twitter, each has their individual profile on Twitter. All of them talking about hunger issues. Their accounts are in their names, but include the organization's logo. Even senior management is tweeting. Some folks have decided it is easier to keep a boundary between their personal and professional lives and set up two profiles (personal profile and professional persona). Certainly with tools like co-tweet maintaing multiple presences can be efficient. But what if you want your organization to be more transparent and open. Here come nagging policy questions. If the lines between your organizational/personal presence are squishy, what is appropriate conduct? Does your organization need something more formal than "using common sense? Do existing employee guidelines suffice? As the organization's leader and if you aren't comfortable or have first-hand experience with social media, how do you trust your staff? 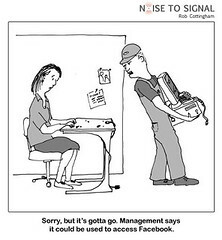 Do you think employee manuals of the future will have "social media guidelines?" Do you think your boss has a right to censor your social media activity? Do you think you have an obligation to do so? I'm not sure we need "social media guidelines," but if your staff is unsure or the executive director is uncomfortable, I think a conversation is needed. I like how Holly Ross from NTEN handles her presence and her staff's presence -- and they are using Twitter for the organization. She says they simply follow their organization's core values. Wendy Harman, American Red Cross, said once, "I use my personal profiles for professional networking and we don't have formal policy. My policy is not say anything on Twitter that would embarrass my mother." About a year ago, I wrote a post about nonprofit blogging policies where I summarized and pointed to examples in corporate and nonprofits and some shared their policy creation process which is embeds culture change. Back in the mid-1990s, as Internet access came into the nonprofit workplace, nonprofits drew up Acceptable Internet Use Policies. This covered what could be downloaded on a computer, whether the employee could use their email for personal use, and browsing the Internet during work hours. While there were many templates, it was helpful to have the conversation when pervasive Internet access in the workplace was a change. Everyone needed to sit down and look at exactly how they could make the best use of this new technology. "Sorry but the computer has got to go, it could be used to access Facebook"
This needs to happen for social media, including establishing clear guidelines for acceptable use for external communications with stakeholders and using social media for a productive, internal purpose. Or else the perception of "wasted time" or fear that employees will play rather than work or view inappropriate content at work. There is another layer too and this is with the IT Policy. For the social media strategists as well as other users, some of the software needed to efficiently use social media at work may be blocked. Or, the IT systems may be so locked down and controlled that didn't give people enough wiggle room for experimentation. Peter Campbell has a terrific post on the ROI of Flexibility, riffing on one of my earlier posts about IT and Social Media. It's important also to think about the opportunity cost of command and control IT policies. Can every on staff be a spokesperson? How do we control and protect our brand? Can our fans remix our logo or will legal get involved? Many organizations just beginning their social media strategy understand the value of listening as a first step. However, eventually listening leads to some conversation and participation. I was working with an organization last year, on a listening strategy. And the senior managers got concerned, "do we want our staff commenting on blogs? When should a senior person respond?" This lead to a productive conversation about those fine points as well as a work flow process. And while they did not map it out in the military precision of the AirForce Blog Response Assessment, it worked for them. Some of this, of course, is organization culture driven. I keep thinking about the presentation that Tony Hsieh from Zappos gave about organizational culture and that he would let any of his thousands employees talk to the press. It's because he has built a culture within the organization where people know what is expected. A couple days ago, an anonymous reader who works in the development department of a large nonprofit, shared a story about how the marketing department want to approval of Facebook Page set up by young professionals and how it took so long that the organization's supporters just set it up on their own. This is an example of how silo and control of brand culture prevents effective social media use. While some organizations may have very formal, written policies about the use of their brand and logo and others have unwritten social contracts, the social contract between your stakeholders and your brand is changing. Last week, I heard a wonderful presentation by Chad Nelsen from the SurfRider Foundation. I had noticed that there were over 300 groups in Facebook for SurfRider, many remixing the official logo. The CEO of SurfRider commented that it was a function of their organization's culture - that everyone is focused on the mission and principles and they have a DIY culture. "We're more focused on the our mission than our brand and so we're open to letting others shape our brand." Even if it upsets the legal department, it is key to scaling their advocacy effort. 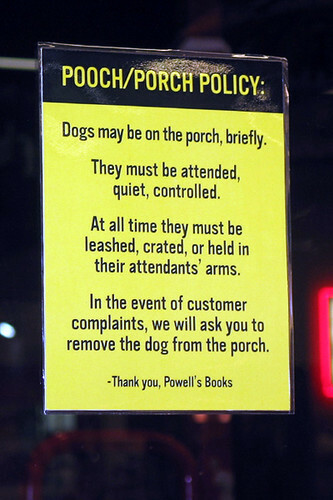 Does your organization have a social media policy? How does the process of creating a policy help or hinder adoption of social media in your organization? How has your organization dealt with culture change issues to pave the way for successful social media adoption? 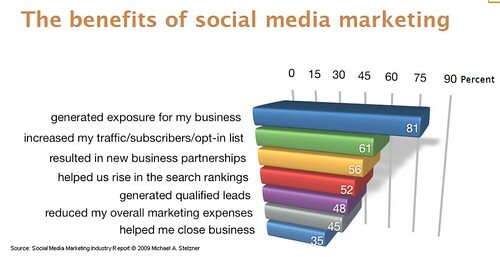 This chart and data comes from a study on how marketers are using social media by Michael Stelzner, sponsored by the upcoming Social Media Success Summit 2009. Where's the nonprofit version of this study? I met Lina Srivastava at SXSW last month and I found her clarifying commentary on the "What is the distinction between social media for charity and social good/systemic change?" very insightful. Ivan Boothe pointed me over to a blog post by Lina with an intriguing tweet "Transmedia activism with a co-creation network." Now to dig into this topic because it combines a couple of interest - storytelling with social media and working in a networked way. Lina offers a concise definition of Transmedia Storytelling, a concept and term coined by Henry Jenkins. Transmedia storytelling is storytelling by a number of decentralized authors who share and create content for distribution across multiple forms of media. Transmedia immerses an audience in a story’s universe through a number of dispersed entry points, providing a comprehensive and coordinated experience of a complex story. At first glance, it sounds like user-generated content strategy but with a more disciplined story telling structure and intentional networked approach than getting your supporters to share your messaging points in their own words or activating the activists with social media or cause-related marketing. Lina points out the marketing benefits of this approach for nonprofits and activists - namely that it not only engages and educates people about the social cause itself, but as part of the process they spread the story by creating content and sharing it through different platforms. It is a much a deeper engagement with the content and the influencers or those most passionate about the cause. 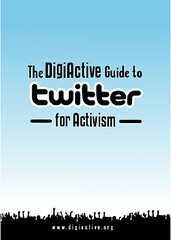 Transmedia activism is one of the best ways to have people connect to a cause, by exposing them to a variety of media properties over various distribution channels—which opens up avenues for dialogue and provides an audience an educational experience about workable solutions—and then working with the most creative and engaged audience segment to facilitate the creation of their own content that further explains the cause and inspires action around it. She offers some examples of this approach from the activism field. I am wondering if or how this concept can be applied to the marketing/fundraising goals? 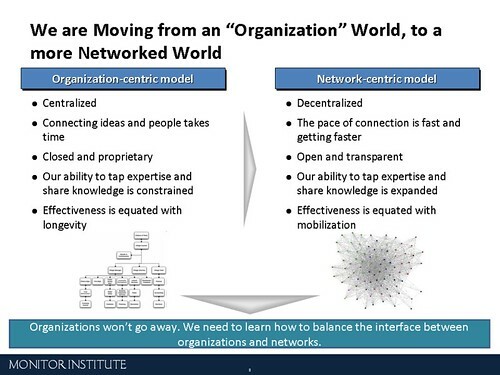 It is also applicable to organizations working in a networked way as well as networks of organizations. How can your organization build a community (or network) that can connect with your cause? How well does your organization's business model support a co-creation network, and how it can be innovative in minimizing its cash outlay while maximizing its outreach? How do you encourage stakeholders to co-create and share their content? Does your organization have access to the technology tools and skills as well as the capacity to collaborate beyond your organization's firewall? I'm going to list sources for some of these tools by general category. Online Collaboration Tools: A co-creation network will require an organization to have the ability to collaborate online beyond the organization's firewalls. These tools can facilitate coordination/discussion/communication amongst key stakeholders about the content. 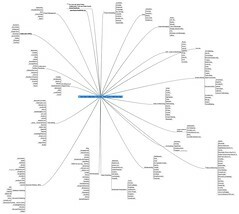 The diagram below is Robin Good's Collaborative Map of Online Collaboration Tools. There is an inherent tension between strategy and tactical implementation of using social media to support a campaign's objectives or nonprofit's mission, whether the goal is fundraising, marketing, or taking action. Those who are just beginning to incorporate social media into their strategic thinking struggle with: "How do we get to know and understand how a particular tool can help us meet our goals, but not let the tool drive our decisions?" It's certainly exciting to see technology being used in ways that amplify and extend the impact of movement organizing. I think it's easy, however, to misread the technology as the cause of the movement rather than as simply a tool of it. There's a tendency to collapse the strategy and the tool — to attempt to feast on the fire itself. To say, "This is what we want to accomplish, and, hey! there's a tool that does that!" — and then equate the tool with the strategy. But they're still separate thought processes and separate stages in developing a campaign. Begin with your campaign's strategy — the food you want to eat. Then determine which technologies will best cultivate the fire within your supporters to achieve the social change you seek. Once this is in place, it is important to understand how the tool can or can't be use to reach that goal, what the limitations are, and how to take a "multi-channel" approach. This requires getting your hands on the tools and doing some experiments. But not wild experiments - having a objective, metrics to monitor, and a reflection process. There is a useful section that explains the getting started steps. What's missing is a Step 0 - which is asking the question - "Is Twitter the best tool to reach your campaign strategy outcomes?" The rest of the guide is a great basic primer on getting started with Twitter. Earlier this week I participated in a convening on Network Effectiveness hosted by Packard Foundation and the Monitor Institute (reflections here) One of the participants, Catrina Roallos, New Media Strategist from ACLU of Northern California, gave me a laptop sticker for their DotRights Campaign for online privacy. One of the questions that came up during a discussion of concerns at the beginning of the day, was "We have 5,000 friends on Facebook, now what? How do we activate the online activists to take action offline?" I was not presenting, but decided to use Twitter crowd source some suggestions, screencapture them, and put those into my presentation later in the day. 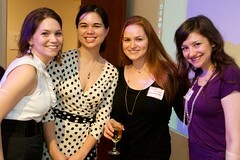 jeffshuck@kanter I'm biased, but events are a powerful way to move online advocates offline. Create something to attend! jonratliff@kanter face to face meetings deepen the enthusiasm for activism. I suggest a tweetup. chloevdc@kanter remind them that the tools they use can only go so far. technologies are only as good as the people (and activists) behind them. jordanepstein@kanter Make it fun, empower people to simply and easily make a personal difference and get commitment. jaygoldman@kanter Rewarding verified offline actions with online social credit. Karma points for being good. carlainsf@kanter Make action practical, easy. Promote cross-platform: FB, LI, Twitter, email>blog>online poll/petition--->offline events. joewaters@kanter Re: @mary_joyce comments. Blue State Digital gave BOS presentation on this very point. @bigguyd has details. ghennipher@kanter TweetUps and other events to help them feel involved with the cause. jpickett1968@kanter Ask them to tour your facility to assist with fundraising or volunteering. paulcip@kanter let everyone propose and lead their own fave activity related to group objectives via mail list, bbs, etc. tomjd@kanter Make it as easy and intuitive as possible. Identify leaders/super-activists and empower them to host local events. 02mytwi01IMO the right question: RT "@Kanter What are the best ex_les of converting ... o_l activists to offl_e activists? W. strateg.s do you use?" MandyGRS@kanter Give them a wide range (in terms of difficulty) of activities to do offline. That way you can meet the activist "where they're at"
What are your best tips and practices for activating the activists offline? Have a blog post on this topic? Please leave a comment. Thanks! The session provided an overview of networks, introduction to different network types and typologies, an overview on network mapping techniques, and a diagnostic that helps those leading networks identify areas of strength and improvement. The diagnostic tool includes 8 different areas: membership, leadership, governance, purpose, strategy/structure, assessment, communications/technology, and resource management. The session was expertly facilitated by the Monitor Team which included David Sawyer, Diana Scearce, and Heather McLeod Grant. I learned a lot from the material presented by Monitor and their facilitation processes as well as the insights shared by participants about their network effectiveness in general as well as their use of social media. I did a presentation on social media and nonprofits in the afternoon. In preparation for the session, I took at look at the "social media footprints" of participants. We also did a pre-survey to learn where they were in terms of using social media for external communications. This was very helpful as always because I tend to incorporate participant examples in the materials as much as possible. In reflecting on the desired attributes in the diagnostic tool, these are useful for assessing communications and use of technology for what I called "inward facing" groups or a bounded group where the members are known and the purpose might be for internal communications, coordination, collaboration, sharing resources, and learning. And the choice of tools may not be focused on consumer-based social media tools and is much broader to include online collaboration tools. This requires a different set of asessment, planning, and implementation steps than you might follow if you were creating a social media strategy for external communications. Both attributes would also need a set of checklists, benchmarks, or more detailed assessments to unpack effective social media use both for inward facing and outward facing goals. It's hard to balance a wide diversity of experience and interest in social media in a training or working session. If the session is not focused on technology, but just a small module in the day -you need to have a short brief high level overview and a separate deeper dive for those seeking practical, nitty tips and information. For those organizations/networks looking to select tools to support their work, there needs to be some exploratory, hands-on experience. If this is their first foray into social media tools, they should seek out low-risk, simple experiments that are fun. We created a network of fans who are remixing our context and spreading our message, how do we guide them effectively without controlling them? Using social networks creates more information and touch points, how do you manage overload in a networked world? What are some simple "learning experiments" that use "first steps" that we can follow to get started? How you balance your persona/professional presence with the organizational presence? How can we best support our network's work online if some members have slower Internet connections? How do we create a safe place (private) for discussions? How we engage our members online when there is a lot of diversity, people are busy, and have lots of other things to do? How do get to know the tools, but don't let the tools drive our choices? How do work in a networked way and not get overloaded? What are some simple ways to use technology to support working wikily? I am participating in this year's "Connected Futures: New Social Strategies adn Tools for Communities of Practice" a five week online workshop for community managers, designers and conveners to explore social strategies and tools to support their work. The workshop begins on April 20th and you can register here. If you have taken on the role of community manager or are tasked with online facilitation of a community, network, or group and want to see how and if social technologies fit, this is the workshop to take. For the first Connected Futures workshop almost a year ago, I led a field trip to the NpTech Tag Community and participated as faculty. 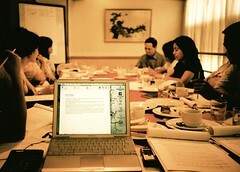 I'm excited to see how the workshop as evolved and be a participant. I've had a long relationship with CSquared. In 2007, I was a "leader" in a program called "Shadow the Leader" where I had an opportunity to reflect with colleagues and peers on the challenges and learnings from leading a tagging community. My relationship with CPsquared grew through my various collaborations, conversations, and explorations with Nancy White. Everytime I connect with colleagues at Cpsquared, it is an opportunity for reflection. I've been thinking about the role of a technology steward and how the tasks, skills, and role applies to someone who works in a nonprofit and is responsible for social media strategy. We know that successful social media strategy isn't as effective when it is siloed with one person in the organization - the intern in the corner or a part of a web staff person's job. The organization has to own it. I'm also looking at this role in the context of working wikily. 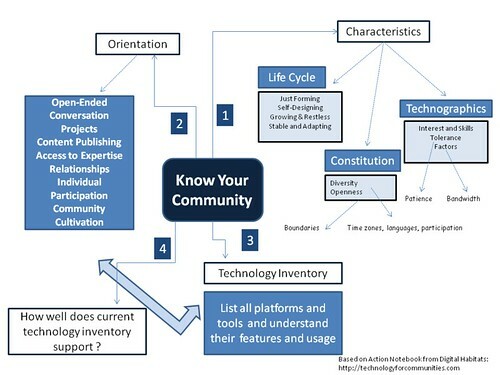 In the Action Notebook for DigitalThe Preamble is a set of reflective questions about "Being a Technology Steward" that help you discover your community's capacity, ability to learn, time capacity, and role in the community. These are great questions for social media strategists or those responsible for social media strategy in their nonprofit to think about if they are to take an evanglist role within the organization. Often, I get the question "What wiki software should we use?" or "What blogging platform should we use?" - and that's a great question, but there several steps that come before answering that question. 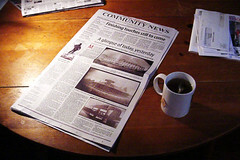 The first step, of course, is to understand your audience or community - and its context. I love the sequence and categories of questions that are presented in the Digital Habitat's Action Notebook and I can't wait to test these out. What I like most is the section that is labeled as "Technology Aspirations" or what I relabeled as "Technographics." The questions really unpack the issue of technology comfort without any judgements. You need to consider and respect Technology Savvy (Does your community have the interest and skills to learn new tools) and Technology Tolerance (What is your community's patience with technology?). Looking at this way really helps you avoid the trap of shiny object syndrome and making tool driven decisions. What Are Your Best Tips for Organizing or Facilitating a Charity 2.0 Event? We're seeing the rise of social media to promote, organize, and in some cases hold the actual charity event itself. While initially driven by "free agent" fundraisers (those not on the organization's board or staff, but who are fans and social media users), we'll begin to see more and more as nonprofits adopt social media as part of their fundraising tool box. Even just a decade ago, a typical nonprofit charity black tie event would have a committee of dedicated volunteers who would plan and promote the event. The committee would be responsible for all details of the event, as well as reaching out to their friends and colleagues with personal invitations to the event. There is a long history of charity balls, in the early years organized by the "Ladies Auxiliary" and chronicled in the society pages of major newspapers. As Millennials start to come into their own, we're seeing Charity 2.0 events morph and change. This is not your mother's or grandmother's black tie dinner dance charity event! These are charity parties designed and organized by fans of a charity, mostly younger people. While it is an offline event, the organizers leverage their social graphs to invite friends to the event and use social media for all aspects of managing and promoting the event. The best example comes from Social Media for Social Change (SM4SC), an organization started by Gradon Tripp, that uses social media tools to raise money for nonprofit. The most recent event was held this weekend to benefit City Harvest at the Roger Smith Hotel. SM4SC's goal was to raise a $20,000 donation with $13,214 contributed as of today. The event includes a silent auction and company sponsorship. In October, Social Media for Social Change organized a similar fundraiser event at the Harvard Club in Boston and raised more than $20,000 for Jane Doe, an organization that fights domestic violence and sexual assault. At December's Boston Social Media Breakfast, Gradon Tripp shared that the event exceeded their expectations and they decided to replicate the idea in other cities with other charities. The event in NYC was the first. They also ran a couple of "virtual fundraisers" leading up to the April Event which served to provide an opportunity for those who couldn't attend the event in NYC to contribute and to promote the offline event itself. On March 7, Meg Fowler and others from Social Media for Social Good organized an online fundraiser, called Stay In and Help Us. They asked their friends to figure out how much money they might spend on a Saturday night out (dinner and movies) and contribute the money to City Harvest, a nonprofit organization in New York that rescues food from restaurants and supermarkets and delivers it to soup kitchens and other programs that feed the hungry. The event used social networks like Twitter and Tumblr for real-time updates on the event and had the ladies of Sleepover 2.0 live streaming for entertainment. The event raised about $1,400 within six hours. On March 26, they asked their online buds to participate in another Twitter-based event, TenBuckThursday, to fuel online donations for April 3rd charity event. Another example of offline/online charity event was the Social Media Smackdown which took place mostly online, although it was launched at a face-to-face event sponsored by Mashable and Blurb during SXSW and hosted by PayPal, Kompolt and Mashable. This charity event was not a self-organized, networked fundraiser, but an example of an agency-driven event. The two-week fundraiser had nine teams of social media influences and celebrities competing against each other to raise for money for nine different charities. In total, the event raised over $35,000 for charities and non-profits in less than 2 weeks. We're also starting see how social media and social networks are allowing individuals to connect and self-organize charity events outside of a nonprofit organization. There is a both an online and offline event that take place at the same time. Twestival is the most recent and impressive example. It was a networked fundraiser of a scale we haven't seen before, raising over $250,000 from over 200 cities around the world via Twitter. As my colleague David J. Neff from the America Cancer Society quipped during our panel at SXSW, "Twitter meetups just to meet are so 2008. We want to meet up and do something with more purpose than just have a few beers." I described the Twestival as "Look Out Here Comes Everybody To Raise Money for charity:water on Twitter" with a wink to Clay Shirky's work. This raised some interesting discussions among nonprofits about networked fundraising, namely "Are Groundswell Fundraisers A Distraction or Opportunity?" I had a chance to meet Twestival's founder, Amanda Rose at SXSW and chat with her. Last month, I did a reflection interview after the event with her to discover what worked and what didn't. Amanda organized the event as a volunteer and she is looking at the next version of the Twestival. Organizing live events takes a lot of coordination, planning, systems, and time. Be sure you have the capacity to pull it off. Find and connect with others who want to help you get it off the ground. If you are passionate about a cause or issue area, do you due dilligence to find a nonprofit that is doing quality work on this issue. Britt Bravo has some terrific advice. If you are from a nonprofit and you want to facilitate or encourage free agent fundraisers or fans to help you or organize a charity event for your cause, you need to start with listening and identifying the influencers in your issue area. Begin to build relationships. What are you tips and suggestions for pulling a successful Charity 2.0 Event?